Mark Allen vs Luca Brecel Round 1 Final Frame Dafabet Masters 2018. It was a Masters debut for the Belgian Luca Brecel as he faced Mark Allen in the opening round of The Dafabet Masters 2018. Mark Allen edged-out Luca Brecel 6-3 with ease and he will either face Ronnie O’Sullivan or Marco Fu. Luca Brecel bizarrely used two cues during this match as he was having some cue issues after losing his cue at the International Championship back in November 2017. Two cues are better than one? Not for Brecel. 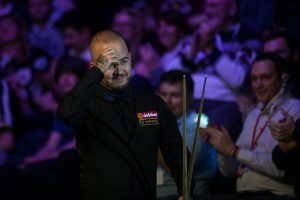 Allen also had a memorable moment as he was accidentally introduced as Mark Williams by Dennis Taylor, the 1985 world champion and tournament announcer. Both Marks (Allen and Williams) progressed to the quarter-finals in Alexandra Palace London.